Home > Treating Hair Loss > When to Seek Medical Help? Hair loss can be a very devastating and frustrating condition that can take time, patience, and understanding to deal with. However, it can also be a sign of a serious medical condition that needs immediate attention. Your doctor will determine whether hair loss is harmless or serious, but there are a few things that can help you decide if you do need medical help. Getting to the cause of your hair loss will determine what to expect from the condition and what you should do about treating or coping with it. Hair loss can be caused by many different natural and unnatural causes. And, depending on the cause, the hair loss can be Temporary or Permanent, and need medical attention or not. Some of the most common causes of hair loss include medical conditions, Medications, medical treatments, Genetics, Diet, overuse of hair care treatments, and Stress. By exploring these causes you can easily decide which ones will need further medical help and which ones can be left to run their own course and resolve on their own. 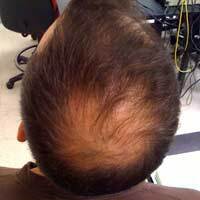 The most harmless causes – male pattern baldness (genetics), damage from hair treatments, and hair loss due to childbirth – do not need medical help and do not indicate any other medical conditions. For Male Pattern Baldness (androgenetic alopecia), your best course of action is a commercial hair restoration treatment, hair transplant surgery, or a hairpiece. For hair loss due to damaging hair treatments, you need to stop the treatments immediately and wait for healthy hair to grow in. Hair loss associated with childbirth will end once the baby has been delivered and the hormone levels of the body return to normal. The other causes of hair loss, however, may need some medical help before the hair loss will stop or reverse. If your hair loss is due to a medical condition, such as a thyroid disorder, anaemia, high fever, or infection, you will definitely need to see a doctor for treatment. Once the condition is treated and cured your hair loss condition should also resolve. Hair loss due to the taking of certain medications (such as birth control pills and high blood pressure pills), or the receiving of certain medical treatments (such as chemotherapy or radiation) do not need medical help since the doctor will be aware of the side effect of hair loss. However, if the hair loss worsens suddenly or spreads to other areas of the body, it is best to inform your doctor of the change just to be on the safe side. If your hair loss condition is a result of a stressful event or a very low calorie diet, you definitely need to see your doctor about the condition. Stress and poor nutrition can have long-term effects on other systems in the body and the condition may need treatment before it does irreversible damage. The best rule of thumb when contemplating medical help for hair loss is if the hair loss is unexplained, worsens, or is overly bothersome it is always a good idea to speak with a trusted doctor. If you have determined your hair loss is not medically significant but you are still concerned over your hair loss you may want to seek medical help of a different nature. When permanent hair loss that affects the scalp becomes too noticeable many individuals seek medical help for hair restoration. Medical help for the restoration of permanently lost hair includes hair replacement surgery, the use of topical hair growth medications, and corticosteriods injections to stimulate hair growth. If you are contemplating any of these medical procedures for hair loss treatment you need to schedule a consultation with a reputable hair loss doctor right away to discuss your options and determine which hair restoration solution would be ideal for you. Before you choose a medical treatment to combat your hair loss make sure you are fully informed of the pros and cons. For more information, read about Follicle Injections, Scalp Reduction Surgery, and Other Surgery For Hair Loss on this site.